The UNECE and the German Energy Agency (dena) have joined forces to issue this report, which features good practices for and experiences of renewable energy policymaking. All countries can benefit from the experience of others in their quest to “do renewable energy right“. The renewable energy markets of the 56 UNECE members are rather heterogeneous. Some countries boast high renewable shares in their heating and electricity systems, while others still mainly rely on fossil energy sources. Despite the mixed status quo, potential for renewable energy development is extensive in all parts of the region and wind, solar, hydro- and bioenergy installations could be deployed with relative ease in some instances. 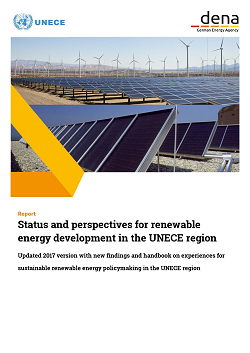 This report provides a comprehensive analysis of the status quo, recent developments and prospects of renewable energy markets within the UNECE area. Moreover, it examines the renewable policy promotion schemes put in place in the respective countries and offers recommendations for successful policy formulation and implementation. The report draws significantly on the results from two expert workshops with regional energy insiders conducted in November of 2017 in Bonn, from the UNECE Renewable Energy Hard Talks, multi-stakeholder dialogues held in Georgia, Ukraine and Azerbaijan, as well as on other recent publications and trends.